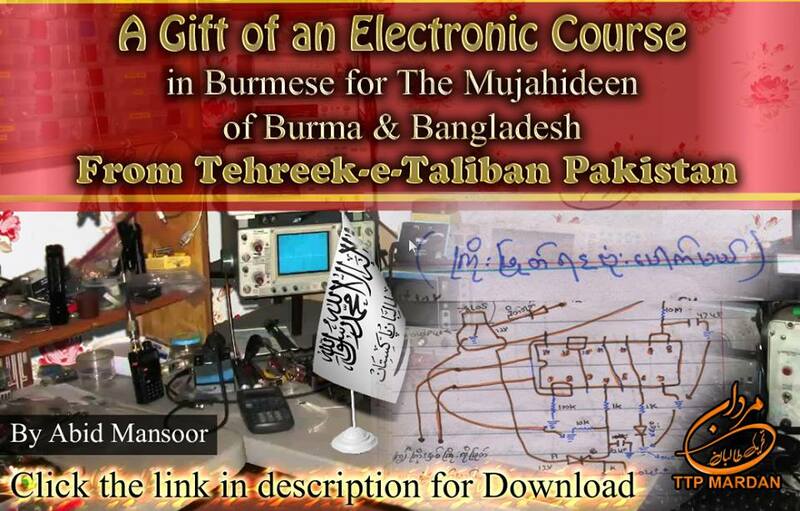 Pakistan Tehreek-e-Taliban (TTP, Mardan) have posted of a “gift” of a new electronic course for mujahideen in Burma (also known as Myanmar) and Bangladesh. The statement comes via Abid Mansoor. The course “Jihad Electronic in Burmese” is 112 pages long, handwritten in different colour inks on lined paper with a series of drawings and diagrams. The posting on social media drew 40 “shares” on Facebook alone since it appeared on 16th January. “Dhaka says thousands more are massed on the border, but has refused urgent international appeals to let them in, instead calling on Myanmar to do more to stop people fleeing. “The organisations in the Hefazat coalition are based at more than 25,000 madrassas, or religious schools, across Bangladesh. Is the persecution of Rohingya fuelling new insurgent groups in the region? “An open letter to the UN Security Council, signed by 23 peace laureates, leaders and activists, warns the offensive has killed hundreds of Rohingya people and condemns Burmese State Counsellor Ms Suu Kyi for ‘not taking any initiative to ensure full and equal citizenship rights of the Rohingyas’”. Groups such as TTP Mardan outside the country are clearly keen to engage with militants or “would-be” fighters in Burma and Bangladesh and have years of experience fighting the military within Pakistan and Afghanistan. News of an online course on offer from the group will surely set alarm bells ringing with state authorities whose oppression of Rohingya may have unleashed an oncoming wave of violent retaliation.